Yaroslavl is part of a popular tourist route in Russia - the so called Golden ring line, which includes medieval towns, located northeast of Moscow, including Sergiev Posad, Pereslaval Zaleski, Rostov, Kostroma, Ivanovo, Suzdal, Vladimir and others. In recent years, Yaroslavl and in particular the City have worked hard to guide the development of the village as a popular and intriguing tourist destination. In 2005 the historic center of Yaroslavl was listed as a UNESCO World Heritage Site. The historic part of town is situated where the river Kotorosal empties into the emblematic of Russia Volga. Yaroslavl is the center of the Russian land, it is located in central Russia. The town was founded on August 2, 1010 and as of the census in 2006, population is 603.7 thousand people. The whole complex is located in an area of 205.37 sq. km. It is located 282 km northeast of Moscow. Yaroslavl extends along both banks of the Volga River and is considered one of the most beautiful cities not only in its course, but and across Russia. The history of Yaroslavl began in the early 11th century, it is believed that the founder of the settlement was Yaroslav the Wise, who wanted to protect Rostov from the north. Most likely to that date locals in the land were representatives of the Finno-Ugric people. The first mention of Yaroslavl in historical texts is dated shortly after its foundation - in 1071. From 1218 it became the center of an independent principality. In 1463, it is connected to the Moscow state, but in the 17th century was the second-largest city in Russia, where, during the Polish occupation of Moscow in 1612 was de facto the temporary capital of the country. 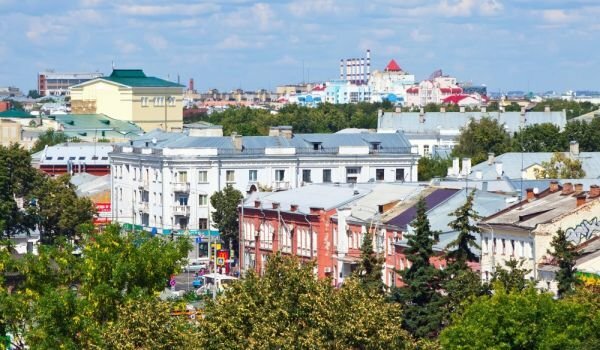 Today Yaroslavl is considered a major industrial center: the world's first synthetic rubber plant and oil refinery are there, as are factories for tires, engines, repair of electric locomotives and shipyards. Simultaneously, Yaroslavl is an important transport hub, as there are many main roads meeting here and Volga has 2 bridges built here. Among the most memorable sights of Yaroslavl are its churches and cathedrals. Two of them can not help but make a great impression. 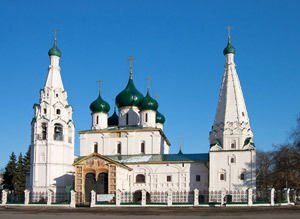 One of them is the Transfiguration Cathedral, which is the oldest facility in Yaroslavl. The church was built in 1506-1516 year on the basis of the initial building that functioned from 1216 to 1224. In the 16th century there was a Monastery, which is surrounded by a stone wall. It is from there that in 1612 the militia of Kuzma Minin and Dmitry Pozharski headed for the liberation of Moscow. 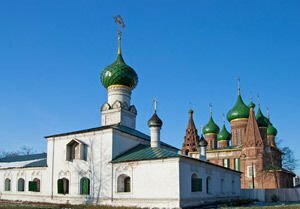 The second remarkable religious building in Yaroslavl is the temple prophet Elijah. It is considered a true pearl of ancient Russian architecture. The current building started building in 1647 and finished in 1681, but the forerunner of this temple had stood for centuries before that date a little more south than the current one. According to legend Yaroslavl Mudriy founded the city on the day of Elijah and so the temple was named after this prophet that ancient Slavs associate with Perun.